I think it was Lonely Planet that had an entry about transport in Melbourne that bemoaned the fact they are no longer the traditional wooden trams of olde but instead “pneumatic monsters”. They might have been talking about tram numbers 2001 and 2002. They are B-class trams, but with a difference. These two were the prototypes, sometimes known (Bananas-in-Pyjamas-like) as B1 class. The other 130 are B2 class. The two B1s have venetian blinds — which seems positively civilised. Unlike the B2s they have LED destination lights (upgraded, as far as I recall, from flap versions). 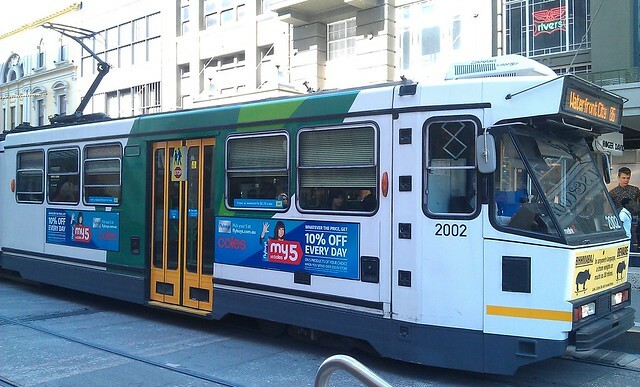 They were originally built with poles, not pantographs (no regular Melbourne tram still has a pole; they’ve all been replaced by pantographs, which don’t come off the wires so easily, and don’t need changing over at the end of the line). And unlike the others they make noticeable curious pneumatic noises as they come to a stop. Next → Next post: Why does the Metlink (PTV) app list more train cancellations than the Metro web site? Public transport should be about moving people efficiently, safely and comfortably and at the lowest cost (to taxpayers and users). Nostalgia comes second. PS I love the word “pantograph”. I think they had white on black electric roller blinds, like A and Z3 class. I was on one of the two a few years ago and it rolled backwards about one metre when it was starting off. Also, I think “pole” is better known as a “trolley” or “trolley pole”.